Habit: Shrub, strong-smelling. Leaf: blade lanceolate to ovate. Inflorescence: raceme or spike, longer than wide. Flower: calyx 4-toothed; corolla 5-lobed, +- 2-lipped; stamens 4; ovary 2-chambered, ovules 2, style unlobed, stigma +- spheric, terminal. Fruit: nutlets 2. Habit: < 2 m, +- rounded. Stem: branches many; twigs brown, angles white. 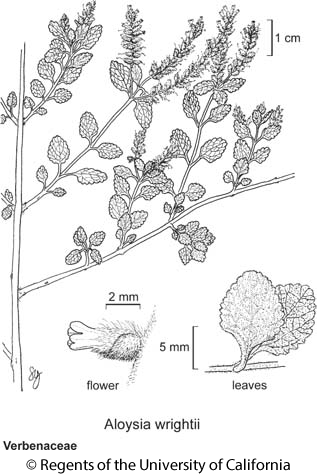 Leaf: petiole < 4 mm; blade 4--17 mm, ovate to +- round, crenate, abaxial face densely hairy. Inflorescence: spike 1.5--6 cm; axis densely and finely tomentose; bract slightly < calyx, lanceolate. Flower: calyx 1.5--3 mm, puberulent; corolla 2.5--3.5 mm, white, lobes rounded, upper 2 larger. Fruit: < 2 mm. Synonyms: Aloysia wrightii (A. Gray ex Torr.) Abrams; Lippia wrightii A. Gray ex Torr. Citation for this treatment: Dieter H. Wilken 2012, Aloysia wrightii, in Jepson Flora Project (eds.) Jepson eFlora, http://ucjeps.berkeley.edu/eflora/eflora_display.php?tid=12765, accessed on April 20, 2019.
e&s DMtns, e DSon; Markers link to CCH specimen records. Yellow markers indicate records that may provide evidence for eFlora range revision or may have georeferencing or identification issues. Purple markers indicate specimens collected from a garden, greenhouse, or other non-wild location.